Mummy-Tips: Get yourself a one off designer statement bag at highstreet prices..
Get yourself a one off designer statement bag at highstreet prices.. There is obviously a bit of a theme forming with the number of bags that i am featuring here. And actually I do recall someone saying to me once that if you own more than six of something then that constitutes a problem - so along with strollers, shoes, socks, tights and coats - I have to admit that I have a bit of a bag problem. As with coats, shoes and strollers - the main issue I have is that you need one for every perceivable occasion. Which for me being a mum, businesswoman, girl about town and secretary at the kids gym club = a lot of bags. I don't let it get to me, but choose to embrace this small problem! Now my last bag purchase was by my own admission a bit excessive (a Channel 2.55, black, quilted lambskin if you are interested) but I have wanted one for so long - and I did save up for it like a very good girl - and i did buy it at the airport saving myself a whole heap. My newest bag love - comes from a new company called Rustic Clash. They have a whole range of bags for every occasion that are hand produced in the UK using reclaimed fabrics. 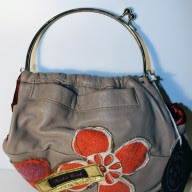 With my mummy head on - the shoulder or weekend bags will both double as a changing bag - but the whole collection is fab. They have some beautiful designs and each one is a one off. Or for the creative amongst us they have a Create Your Own feature - where you pick your basic style and then your own fabrics from their collection. Hands up. I have a bag obsession. Definately check out the website. Fab Bags!